Aubrie Stephens 5th in Introduction to Business Procedures; Maddie Moloney 5th in Business Law; Cadrian Hutsell 5th in Introduction to FBLA; and Landon Medlock 5th in Networking Concepts. Special recognition and awards for the top 5 at districts went to: Sara Taber 3rd in Impromptu Speaking; Isaac Haden 3rd in Website Design; Eli Keeney 3rd in Word Processing; Haley Long 4th in Word Processing; Hailee Britton 5th in Introduction to Public Speaking; Katie Kinder 5th Computer Applications; Winter Murray and Cade Richards 5th in Broadcast Journalism; and Reece Derrickson, Cainan Hutsell, and Connor Medlock 5th in Sports and Entertainment Management. 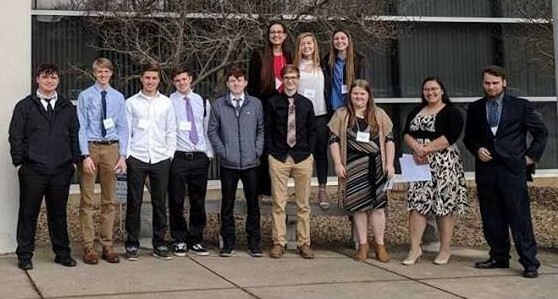 Top 10 finishers in their respective events included: Carson Chambers 6th in Networking Concepts and 8th in Introduction to Business; Tyler Chambers 6th in Computer Problem Solving; Haley Long 6th in Health Care Administration; Athena Hood 7th in Journalism and 9th in Advertising; Hunter Krewson 7th in Computer Applications; Eli Keeney 7th in Personal Finance; Carson Chambers 8th in Introduction to Business; Haley Satterfield 8th in Journalism Maddie Moloney 8th in Political Science; Mitzi Freeman 9th in Health Care Administration; Keely Crossgrove 9th in Business Communication; Cadrian Hutsell 9th in Introduction to Business Communication; Katie Kinder 10th in Business Law; Landon Medlock 10th in Introduction to Information Technology; Jocelyn Jacobs 10th in Organizational Leadership; and Josh Lilly 10th in Securities and Investments.